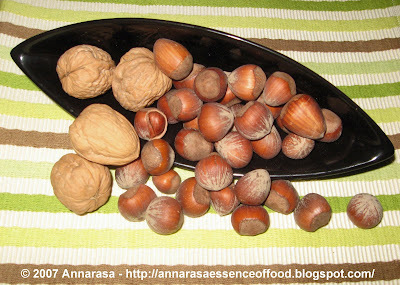 A simple entry for jugalbandi Click: Show us your nuts, December 2007. 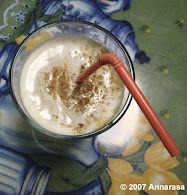 All text and photographs in this blog, unless otherwise noted, are Copyright of © Annarasa 2007. All Rights Reserved. Kindly do not reproduce without permission. Aloo-Gobhi sabzi (Potato-Cauliflower Vegetable) happens to be one of my favourite vegetable combinations. There are so very many ways in which this vegetable combination is cooked and dished out. Yet it is only in winter that one gets the opportunity of enjoying it in this fragrant curry form. Primarily because this recipe uses loads of Dalchini or Cinnamon. Cinnamon which is an essential spice in Indian cooking, is regarded by Ayurveda as a warming spice. It is, in general, used in combination with other spices that complement its flavour and often in its bark form. Also it is used to flavour savoury vegetables and meats from the main course rather than sweets and desserts! Cauliflower curry with cinnamon is a perfect example of this. I find it to be a comfort food - tasty, warming, and utterly delicious once served on a bed of Basmati rice. Now home-baked cookies and I have a history of sorts. I developed an avid interest in baked goodies early on, and as time went by it turned into a passion of sorts. Yes, there's always a time for a story and this is one for Christmas cookies. As I stumbled across Susan's Christmas Cookies from Around the World 2007, I was inspired to dig out my old faithful - a treasured recipe book which holds a collection of my very favourite tried and trusted cookie recipes. Just a turn of the page and memories of baking batches of cookies for school events, for family, friends all came flooding back. Just as much as I loved the aroma of my Mum's kitchen every time I loaded in a fresh batch to bake, the fact remains that I really have not had the time or the opportunity to indulge in this joy for several years. Now thanks to Susan I have come back to delight in baking cookies. Of course half the joy of baking cookies at home (read from scratch) lies in the sharing. With every fresh batch I have been counting off friends and family to whom I am shipping off these delectable delights. May be that is the true spirit of a Christmas cookie - its sharing!! 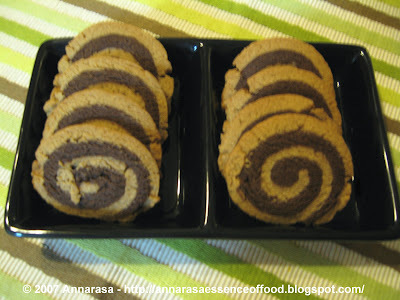 I have picked my favourite cookies - Cinnamon-Chocolate Swirls to share with everyone at Eat Christmas Cookies! Mango is a great favourite on the Indian sub-continent. Indeed, as a mango lover one can't help but be passionate about this beautiful fruit. Every summer, desis in the US bemoan lack of access to the over a 100 varieties of mango available freely on the Indian sub-continent. And every so often I get a mango craving and I am tempted to buy one of the beautiful orange, yellow, and green mangoes in the local supermarket. Yet, these mangoes are very fibrous they don't do too well on a dessert plate. So to satisfy my mango cravings I began to experiment using these sweet fleshy fruits in new ways. I remember standing in my kitchen, mango staring at me when memories of eating sour kairi (raw mango) with rock salt and red chilli powder on a hot summer's day, flashed back to me. Mmmmm, the texture of the raw mango mingling with the sharp and mellow flavours was just heaven. And well, just like that I decided to do the same to the nice ripe mango on the kitchen table. An onion here, tomatoes there, green chillies, cilantro, and freshly squeezed key lime juice - hey presto - utterly delicious mango salsa. You can eat any cuisine in the world, you can travel the globe, you can eat out for days on end - but there is nothing quite like the feeling of coming back home!! Of course, coming home means different things to different people. But in my parents home - it had one simple meaning: "Ghar ka Khana" or simple food cooked at home. I remember as a child we would go for our annual trek in the Himalayas, or on summer vacations across the country only to return home to the deliciously heart-warming dal-chawal. Now you can guess that dal on the occasion meant the humble arhar dal or toor dal, served hot with basmati chawal, and methi-aloo bhaji. Over the years this has become my most abiding memory of coming home. Now when ever we travel, the first meal on our return echos that memory. In fact, this meal is a great favourite in my family. 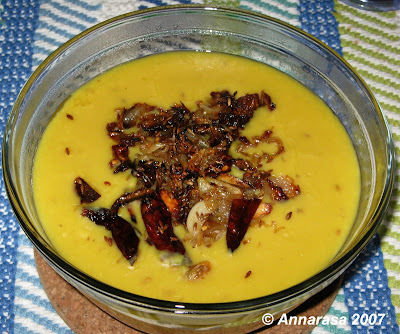 I tend to make toor dal thick and creamy, and top it with a great dollop "ghee ka tarka". Here's my recipe. Soak the toor dal in water for 2-4 hours. Pressure cook the dal with the ginger, tumeric, 1/2 tsp cumin seeds, a pinch of salt. Once cooked, continue to boil the dal until it thickens and becomes heavy. Adjust the salt to taste. For the tarka, heat the ghee in a small pan. Finely chop the onion and garlic. 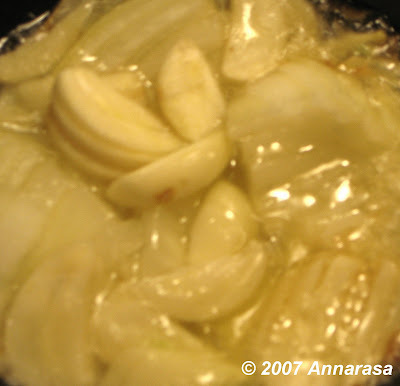 Add to the heated ghee and fry until onions become brownish. Then add the remaining cumin seeds, red chillies, and asafetida. Remove the ready dal into a serving bowl. Season with tarka. Serve with fresh hot Basmati rice which has been seasoned with salty butter and a pickle to tickle your tastebuds!!!! Vegan Substitute: Replace ghee in this recipe with vegetable oil. 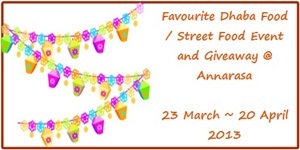 In India, feasting very often follows fasting. 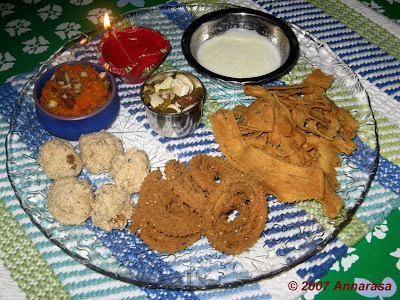 It is customary to observe fasts on numerous days throughout the year. Indeed, people fast on particular days of a week, month, and year to please and honour particular Gods and Goddesses, to give thanks for blessings received, or to pray for that their wishes be granted. A fast usually begins at dawn and broken at dusk. During this time those undertaking the fast tend to partake of only water, fruits, nuts and milk. 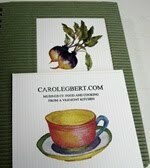 Yet, the entire day is often filled with the joy and camaraderie that accompanies a shared kitchen. Family members regardless of age come together to prepare for the feast that inevitably accompanies the successful completion of a fast. Some feasts are humble and traditional meals where only certain categories of foods permitted on fasts are prepared. And others are grand meals where the host's largess is shared with friends and neighbours. 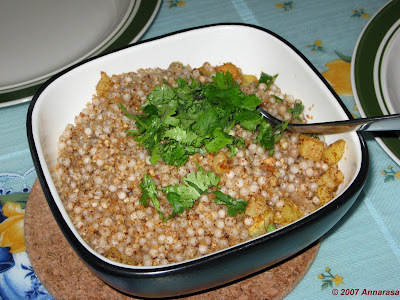 Sabudana Khichiri or Sago Kedgeree is a traditional dish that is most commonly prepared to end a fast with. 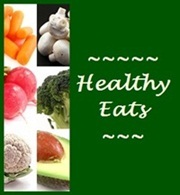 This simple yet delicious dish is viewed as a complete meal and oftentimes as the ultimate treat at the end of a day characterized by abstinence from carbohydrates and salt. 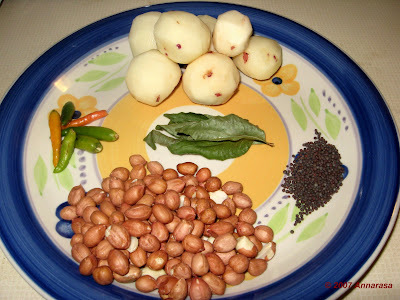 I developed a taste for Sabudana Khichiri early in life and though it was prepared in several different ways by my Mum and my Grandmum, I choose to make it the traditional way. Sago itself is tricky to cook. A little over soaking, a little overcooking and it has a tendency to dissolve into a gelatinous, gluey, and sadly inedible mass. My experience with sago has seen all these phases, and after numerous misses (considerably more) and hits, I have this recipe down to a T! Trial and error are a great methodology, yet in the end I have come to believe that it turns out best whenever I trust my instinct. 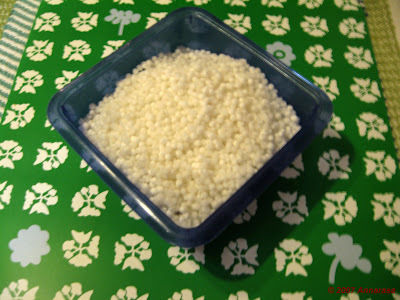 Clean the sago, and soak it in cold water overnight in a deep bowl. 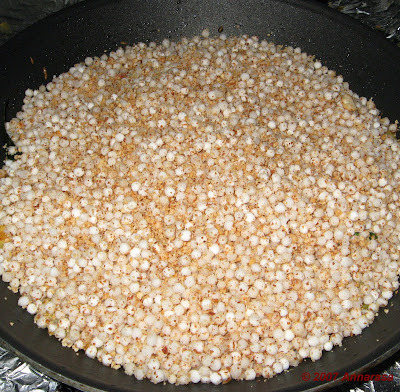 The water should cover all the sago in the bowl and should be at least 1 inch over the level of the dry sago. In the morning the sago should be plump and soft. If you see any excess water, drain it completely. 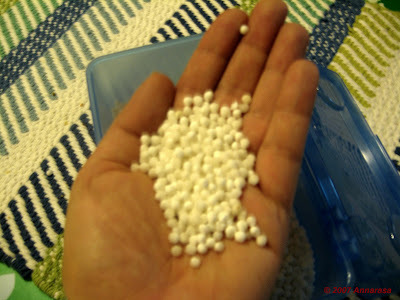 Alternatively if the sago is still hard, sprinkle with more water and let sit for a few minutes longer. Heat 1 tbsp oil in a large frying pan. When oil is hot, add the mustard seeds and curry leafs. Stir them till they begin to pop. 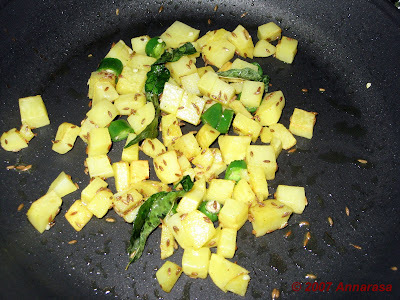 Chop the green chillies; peel and cube the potatoes. Stir them into the seasoning in the pan. Cover the pan and and cook for 10 minutes or until tender. Coarsely grind the raw peanuts. Mix the ground peanuts, red chilli powder, and salt into the soaked sago. Turn this mixture into the frying pan. Cover and cook for 5 minutes. Then remove the cover, add 1 tbsp oil and cook another 10 minutes on medium heat. Stir occasionally. The sago will acquire a translucent appearance once it is fully cooked. 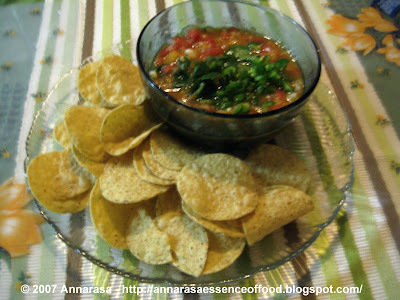 Garnish with finely chopped cilantro. Serve with freshly set yogurt. My husband adores Sabudana Khichiri, and so I do make it with a comforting regularity every so often and usually during the Navratras. But it will always remain for me a childhood memory where this simple fare would become the feast after the fast. And as I am new to the world of Food Blogging, I am dedicating this entry to all you fabulous food bloggers out there who have inspired me to create my own food blog. As a part of this dedication I am sending this recipe out as an entry to Meeta's Monthly Mingle - Traditional Feasts, 3 December 2007. So, I love good food! And here's my tribute to enjoying it and living well. Hope you will visit soon, read often, and savour immensely.